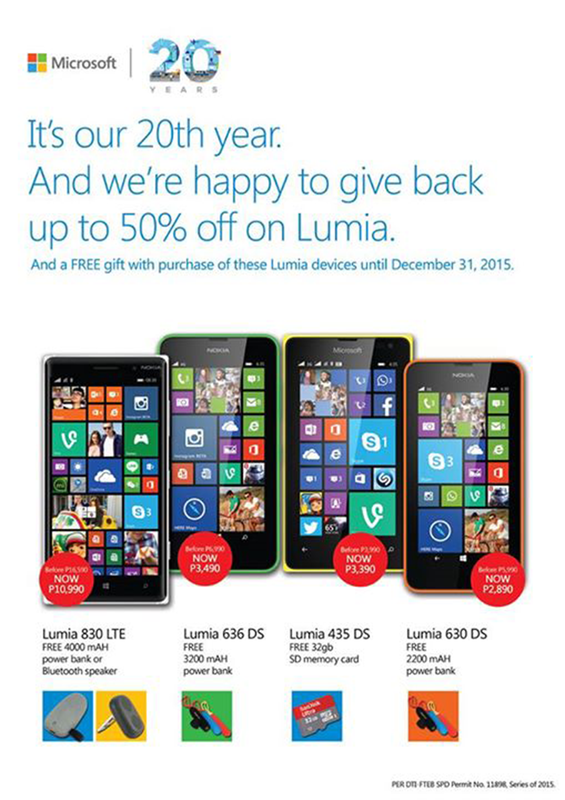 Microsoft Phiilippines Downs The Price Of Several Lumia Devices Up To 50% Off!! Home / lumia 435 / lumia 630 / lumia 636 / lumia 830 lte 10k pesos / lumia sale philippines / microsoft / mobile / news / Microsoft Phiilippines Downs The Price Of Several Lumia Devices Up To 50% Off!! Great news! Whether your're a Windows fan or not. In celebration of Microsoft's 20th year, they're cutting off up to 50% off on Lumia smartphones plus a FREE gift with every purchase until December 31, 2015. What's included in the promo are the Microsoft Lumia 830 LTE, Lumia 636 DS, Lumia 434 DS and Lumia 630 DS. If you purchase the midrange greatness of the Lumia 830 LTE that's now down to 10,990 Pesos, you also get a 4,000 mAh powerbank or a Bluetooth speaker for FREE. With the Lumia 636 Dual SIM, Microsoft cuts the price to 3,490 from 6,990 Pesos which gives this phone 50% off its original price tag. That makes the Lumia 636 DS the most affordable Snapdragon 400 device in PH. Aside from that buyers will get a FREE 3,000 mAh power bank with it. The Lumia 435 is down to 3,390 Pesos and comes with a FREE 32 GB micro SD card while the Lumia 630 on the other hand was given is now priced at 2,890 Pesos with a FREE 2,200 mAh powerbank.